Nothing like good ole classic mashed potatoes. Easy and tasty. 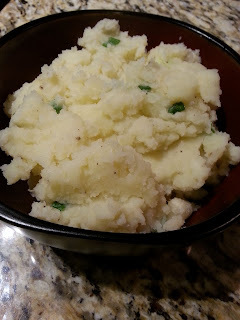 Mashed potatoes team well with other favorite main dishes. Place potatoes chunks in a large pot, cover potatoes with water and add plenty of salt. Bring to boil over high heat. Cook about 20 minutes or until fork tender. Drain and return to pot. Add remaining ingredients except green onions. Mash potatoes until smooth. Fold in green onions. Place in a serving bowl.